He-Man and the Masters of the Universe is an animated program and one of the first cartoons to be produced exclusively for syndication. The series consisted of two 65 episode seasons and ran from 1983 to 1985. The He-Man television show was the very first animated shows to be based entirely on a toy line. Toy company Mattel developed and produced the highly successful toy line in the early 80's. The television program was set in the fictional world of Eternia. The lead character is Prince Adam who is the only son of the rulers of Eternia, King Randor and Queen Marlena. Prince Adam appeared to be lazy and clumsy. He and his pet tiger, Cringer, were often seen resting and goofing around. However, Prince Adam owns a magical sword and when he holds the sword over his head and summons the power of Grayskull Castle, he is transformed into He-Man. He-Man is Prince Adam's muscular and powerful alter ego. Cringer would also be magically transformed from the cowardly pet cat to the armor clad, Battle Cat. He-Man would ride Battle Cat into action. Eternia was filled with a population of peaceful citizens. There would be unrest, however, as the evil Skeletor would try to take over control of the land from King Randor and Queen Marlena. He was He-Man's biggest enemy and most frequent aggressor. Skeletor didn't go into battle alone. He was supported by many evil warriors that possessed various skills and strengths. Some of his henchmen were Beast-Man, Mer-Man, Zodac, Stinkor, Jitsu, Trap-Jaw, Webstor, Tri-Klops, Faker, Whiplash, Kobra Khan, and Evil-Lyn. Skeletor also had his own cat, Panthor, who would be Battle Cat's foe. He-Man had a group of allies to support him in his battles versus Skeletor and his crew of villains. His closest friend and mentor was Duncan, who was also known as Man-At-Arms. Duncan had an adopted daughter, Teela. Teela was also Prince Adam's romantic interest. Orko was Prince Adam's sidekick and served as the show's comic relief. Orko was a levitating magician who used his book of spells to often cause trouble and make He-Man's job more difficult. Some of He-Man's other hero warriors included Ram-Man, Stratos, Man-E-Faces, Buzz-Off, Mekaneck, and Fisto. The success of the cartoon program and the action figure series led to a spin off show marketed to you girls called, She-Ra Princess of Power. There was also a big screen adaptation in 1987 that starred Dolph Lundgren as He-Man. Join He-Man on new and exciting adventures as he battles to keep Eternia safe from the evil clutches of Skeletor in Season 2, Volume 3 (25 episodes) of He-Man and the Masters of the Universe! Join He-Man on new and exciting adventures as he battles to keep Eternia safe from the evil clutches of Skeletor in Season 2, Volume 2 (20 episodes) of He-Man and the Masters of the Universe! Help! It's The Hair Bear Bunch! 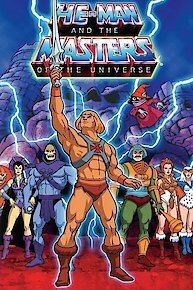 He-Man and the Masters of the Universe is currently available to watch free on Tubi TV and stream on Syndicated. You can also stream, download, buy, rent He-Man and the Masters of the Universe on demand at Amazon Prime, Amazon, Starz, Google Play online.